• Dr. Greg Fenves was confirmed as the new president of The University of Texas at Austin. Fenves, 58, first came to the University to serve as Dean of Engineering, and is currently the University’s executive vice president and provost. Fenves will succeed Bill Powers June 3, 2015. • Bob Saget would be so proud. After Tuesday’s special election run-off for José Menéndez’s old seat in Texas House District 124, we finally have a full House. The last vacant seat in the chamber will be filled by Former Bexar County prosecutor Ina Minjarez. Minjarez won out over fellow Democrat Delicia Herrera, a former member of the San Antonio City Council, earning 55% of the vote. • Gov. Greg Abbott has promised to sign open carry legislation that reaches his desk. The Texas House approved open carry legislation on Monday, which will allow concealed handgun license holders to carry their side arms openly. Similar legislation has already passed the Senate. The bill will now most likely go to a conference committee to reconcile the House and Senate versions. • What the Frack? The House has approved legislation that would prevent cities and counties from passing local fracking bans. The will of the House did not side with local control on this hot button issue. 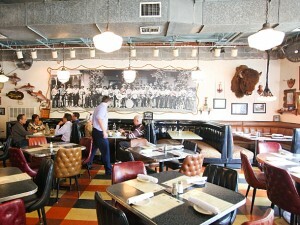 If a 50’s diner and a cowboy had an illegitimate love child, it would be named Ranch 616. The special concept of the restaurant is South Texas Ice House, based on the personal background of chef and owner Kevin Williamson. The cuisine encompasses flavors from the Gulf of Mexico to the border towns of Texas. In addition to its innovative food philosophy, the Ranch’s ambiance echoes its eclectic Texas influences. The restaurant looks like something right out of a Douglas Adams novel with dead animals on the wall, snakeskin booth seats, Jesus candle water glasses, and “damn good” margaritas on the menu.